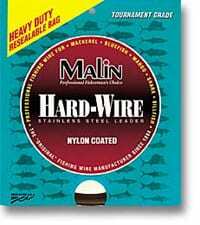 Malin is solid single strand stainless steel leader. It is packaged in resealable bags for easy use and storage. It comes in 42 feet, 200 feet, 1/4 lb., 1 lb., 2 lb., 5 lb., 10 lb. and 30 lb. coils, and is available in sizes #1 through #27, and 25 lb. test through 850 lb. test. Malin stainless steel leader wire is ideal for rigging all types of bait or lures when you need abrasion resistance and protection from sharp teeth. Our leader wire is torsion straightened and treated so it is nearly invisible beneath the water, and is available in the dark coffee colored finish. We also offer the same wire untreated with a bright finish. The experience Malin has gained through the years ensures the highest quality product every time. Our leader wire is also available in bulk quantities in both coffee color and bright finishes. NEW #10, 130 lb. through #19, 400 lb., 42 foot and 1/4 lb. coils are now available with a tough black nylon coating. This NEW coating makes this leader material exceptionally good for Shark and Tuna fishing. Nylon Coated Stainless is solid single strand stainless steel leader. It is packaged in resealable bags for easy use and storage.